Las humanidades se han visto transformadas por el auge de un pensamiento ambiental que ha surgido como resultado de numerosos problemas planetarios (crisis de la biodiversidad, contaminación, cambio climático, etc.) que de una u otra manera han trastocado las relaciones clásicas entre los saberes. 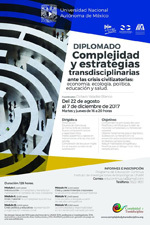 Este hecho ha llevado a renegociar las relaciones entre las ciencias naturales y las humanidades y ha permitido apreciar que la oposición entre lo Cultural y lo Natural puede ser un obstáculo para elaborar diagnósticos y soluciones acordes al tamaño de la crisis. Sin embargo, el giro ambiental es heterogéneo pues en éste confluyen proyectos cercanos a la ecología política y la antropología, pasando por el feminismo y el postcolonialismo, hasta llegar a apuestas de corte literario y filosófico. Por ende, conocer algunos de sus aspectos y sus relaciones con el campo CTS demanda una aproximación interdisciplinaria que permita caracterizar a dicho giro mientras va construyendo puentes entre todos estos saberes. 1. de marzo. Ecología, estética de la naturaleza y paisajes humanizados*. 15 de marzo. Anna Tsing. Friction. 29 de marzo. Anna Tsing. Friction. A wheel turns because of its encounter with the surface of the road; spinning in the air it goes nowhere. Rubbing two sticks together produces heat and light; one stick alone is just a stick. In both cases, it is friction that produces movement, action, effect. Challenging the widespread view that globalization invariably signifies a “clash” of cultures, anthropologist Anna Tsing here develops friction in its place as a metaphor for the diverse and conflicting social interactions that make up our contemporary world. She focuses on one particular “zone of awkward engagement”–the rainforests of Indonesia–where in the 1980s and the 1990s capitalist interests increasingly reshaped the landscape not so much through corporate design as through awkward chains of legal and illegal entrepreneurs that wrested the land from previous claimants, creating resources for distant markets. In response, environmental movements arose to defend the rainforests and the communities of people who live in them. Not confined to a village, a province, or a nation, the social drama of the Indonesian rainforest includes local and national environmentalists, international science, North American investors, advocates for Brazilian rubber tappers, UN funding agencies, mountaineers, village elders, and urban students, among others–all combining in unpredictable, messy misunderstandings, but misunderstandings that sometimes work out. Providing a portfolio of methods to study global interconnections, Tsing shows how curious and creative cultural differences are in the grip of worldly encounter, and how much is overlooked in contemporary theories of the global. 26 de abril. Ursula K. Heise. Sense of Place and Sense of Planet. 24 de mayo. Ursula K. Heise. Sense of Place and Sense of Planet. Includes an epilogue on climate change and its artistic representations to date.